MD5 Checksum Verifier is files integrity checker based on the time proven MD5 algorithms. 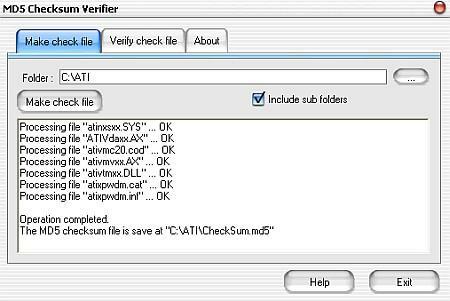 With it you can easily create checksums of files and verify their integrity in the future. The operation is very easy, just two steps, make check file and verify check file. MD5 is a way to verify data integrity, and is much more reliable than checksum and many other commonly used methods.